A great day for training and some stunning views today. 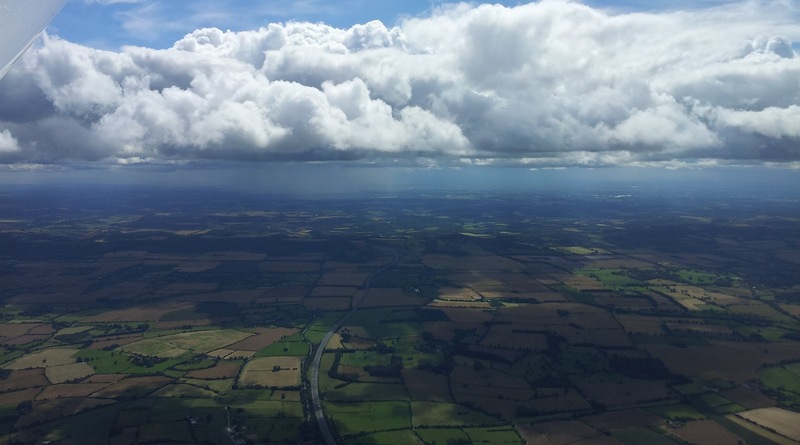 We were surrounded by showers for much of the day, but only had a couple of direct hits. Some great climbs until mid afternoon. Here are a few more pics, the visibility was stunning, my phone camera doesn't really do it justice. 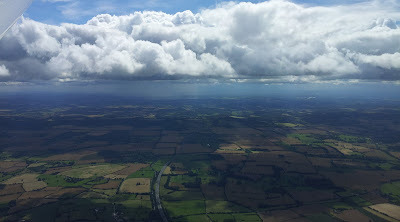 View East down the M40, looks like our usual home at Booker is getting that wet Olympic weather. Final Glide in GBF back to Haddenham, the airfield is there somewhere, from south of the M40. I wonder whether they sell those canopy handles at Ikea? 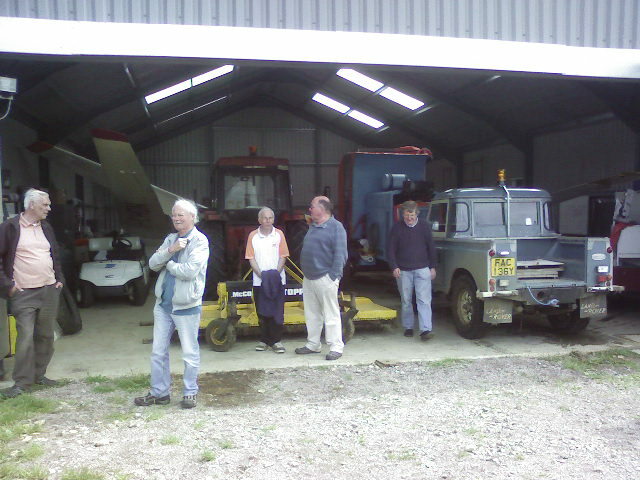 Bob Davy gives a nervous wave before checking out Rob Turner for his Tug Thunderstorm rating. Only joking, they went for tea as soon as they looked to the left. 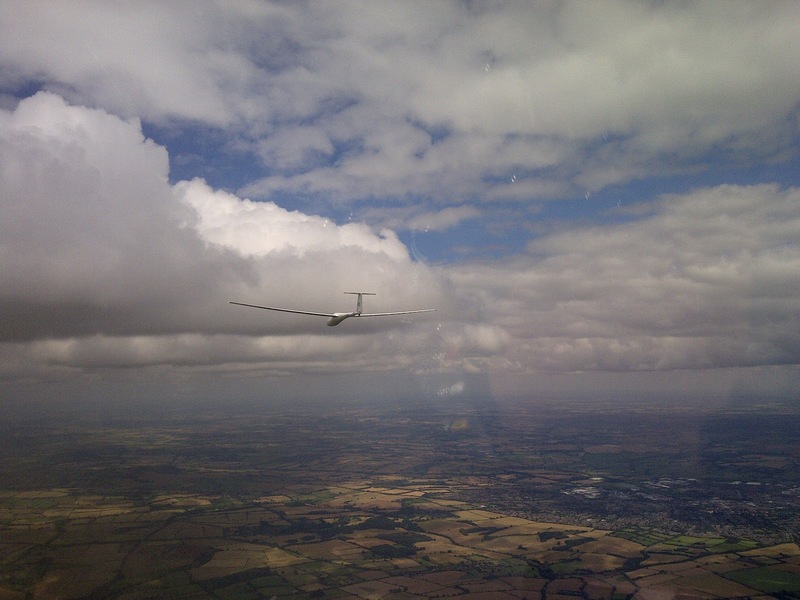 Steve's LS8 attracts performance enhancing rays of sunlight shortly before being dumped on by the meteorological glider washing system. At last - some good weather! Congratulation to Mike on his 300K don't take up sailing Jon it's cold and WET. 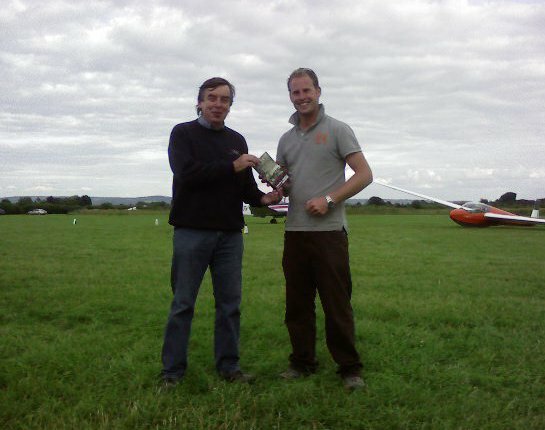 And also to Mike Collet for managing to squeeze a 500 out of it. After Sunday's BBQ and great days flying the rubbish weather has finally given in to a few days glorious sushine under a powerful high pressure system that looks set to stay for a bit longer. This has resulted in everyone getting their sun hats and sun cream out (and coming out to fly). Thame has been buzzing with the flying activity so far this week with flying until well into the early evening and good soaring flights up to to 5,000' in the blue. 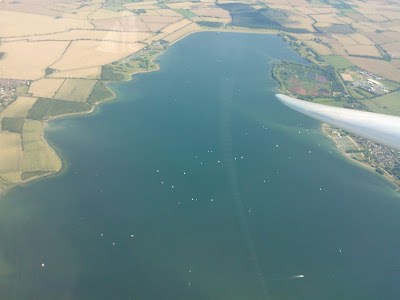 A lot of time has been spent with 'newcomers' to the site to ensure they are aware of local landmarks and exactly where the airspace limits are to make sure we aren't the ones to find out exactly how slow a Typoon flies when it formates on you. 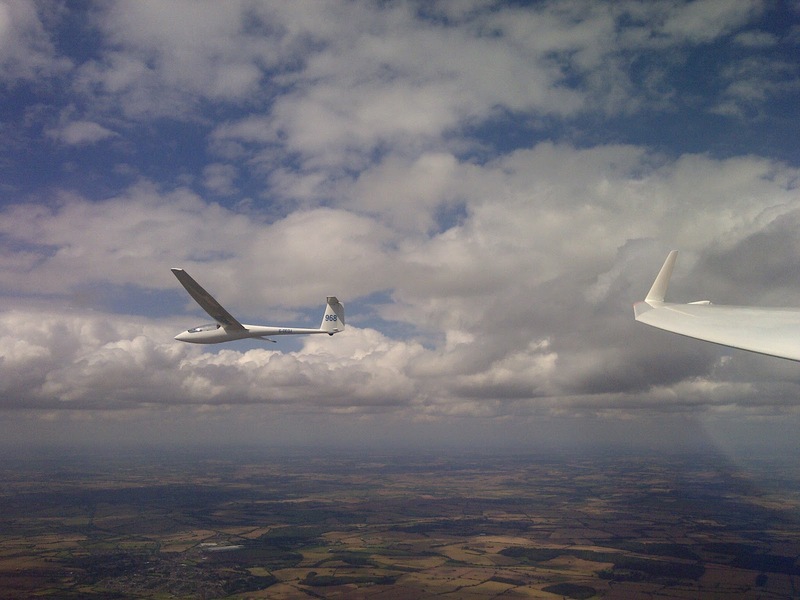 Alongside the Booker pilot there have been many Thame/UBT members coming along mid week to enhance their flying alongside BGC members. 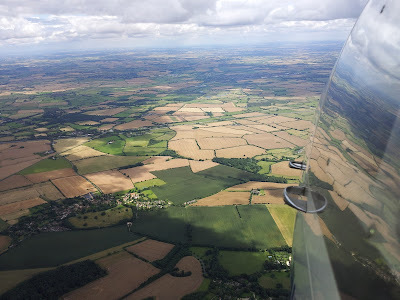 Today has seen the DuoDiscus and the K21 flying non-stop showing local landmarks to each of the pilots as well as undertaking short cross country tasks with Didcot and Bicester cropping up multiple times on the mini-tasks. In addition, the clubs single seaters and private owners have been out flying and enjoying themeselves. The sun worked it's magic and brewed up a some good thermals today. Southerly airmass produced lots of those broken warm air thermals with a few stonking climbs when everything came together in the right places. Many tasks from 100k up to 350k. Sally's afternoon barbecue lasted well into the evening as we faced the challenge of the "all you can eat" meal. Thanks to Sally and to her man (sorry, I'm hopeless with names) for helping with all the cooking. Once again CFA was flying on the winch until late in to the evening as the landout retrieves returned; oh yes, there were a couple of landouts. 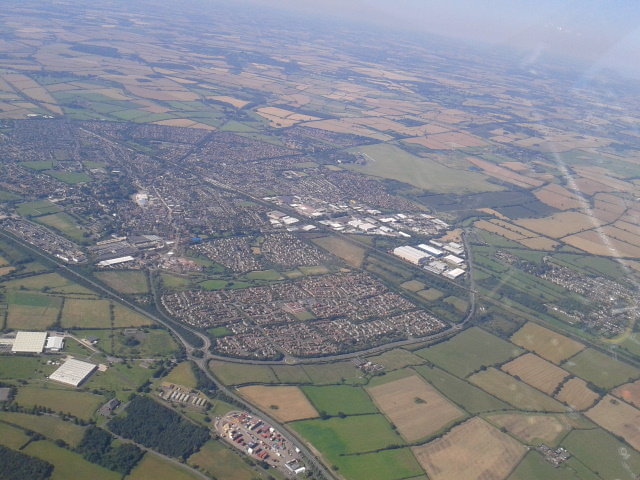 It was tricky if you were in the wrong place at the wrong time, as evidenced by radio call of the day from Bicester "Relights - land where you like, use the whole airfield". Photo of the day from Oli who made it to Graffam Water (and back) in 987. 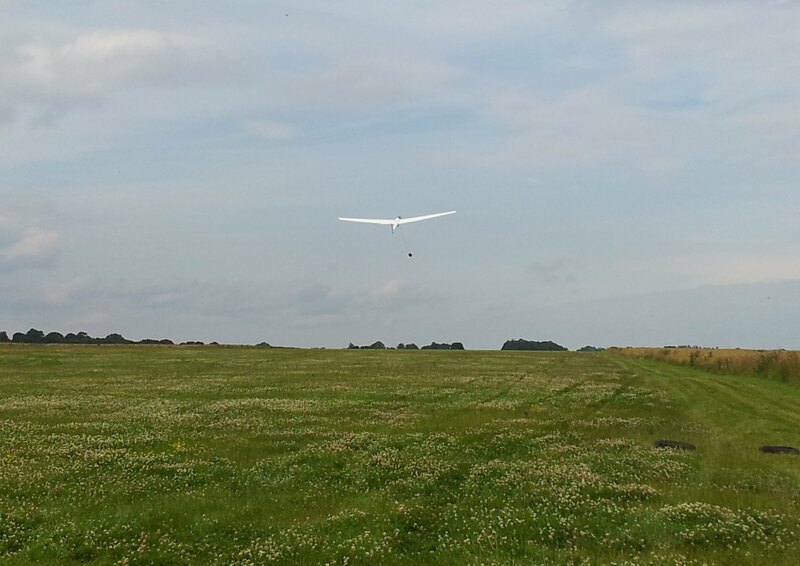 Maryon has been waiting since last year for suitable weather to complete her first glider flight at the age of 85. She came to Thame with her family for the event, and insisted on experiencing a loop, as well as trying her hand at the controls. Another grand day out as guests of Upward Bound Trust at Haddenham. Over 40 launches by Booker Pilots today. 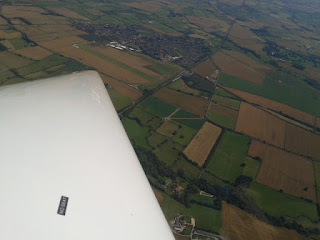 Many club member single seaters have now made the journey to Thame, and most took to the air today. Denis made it to East Anglia, but needed a little help from the motor to get back. 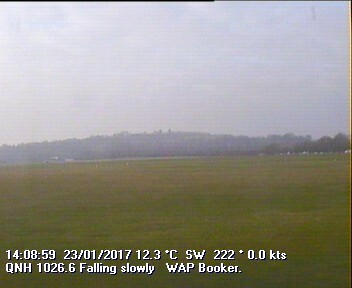 Junior HNK landed out in a very soggy field, judging from the mud caked fuselage, it probably didn't roll too far after touchdown. The airfield operation worked well, and the anyone who followed their nose soon found the catering manager in his tent frying up bacon rolls. In recognition of the fantastic work carried out by Richard helping to get things up and running, Denis presented him with a book about the real Operation Pegasus. Real Star of the day was CFA, still flying well after 19:00. Thame - Day 1 up and running! 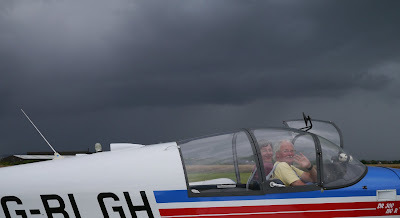 Despite the temperamental weather, flying got underway at Thame with some aerotows and much intrepid winching under the direction of UBT locals (instructor Dave and Henry the winch driver), with a bit of spot landing practice thrown in. Some excellent breakfast / brunch was provided by Denis with the enticing smell of a bacon sarnie and hot cup of tea or coffee in the catering tent. 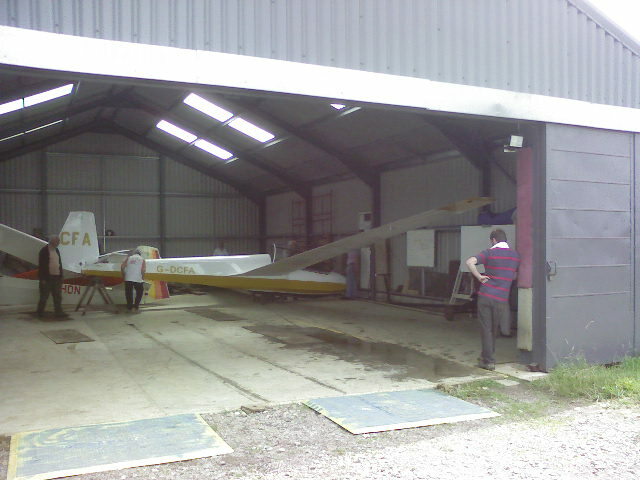 Sadly a big shower signalled the end of play, and a swift dash back to the hangar to spoon in the K13 and the rest of the kit, which somehow all managed to fit in, followed by a retreat to the clubhouse for refreshment. Nicer weather promised for tomorrow! ......... and then closely supervised the hangaring of CFA. ﻿Then the team unpacked lots of food into the tea bar which has been set up in one of the portacabins and lots of kit into the new briefing room. Denis turned up with a tent which tested the spatial skills of some male brains but after a while it turned into a recognisable tea tent with a gas ring and kettle. The final run was Richard with the smart new launchpoint trailer. Come over and see for yourself - the field is a little damp so waterproof shoes are an advantage. With only 2 days to go until the Olympic Airspace restrictions come into place and we start to operate at Thame, the final preparations are being concluded. The temporary clubhouse and briefing room and portaloos have been delivered and the clubs gliders have been moved over to Thame (this being done around the weather forecast). 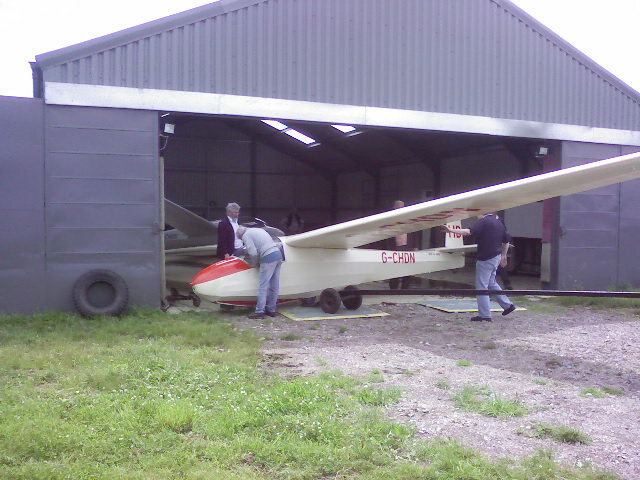 The golf buggies and other 'items' necessary to operate Booker Gliding Club will be moved over on Friday 13th July. Many club members have been involved in this and will be helping again on Friday - our thanks to all of them for their assistance. And best of all - whilst this was all going on operations continued back at Booker with over 25 launches and several soaring flights. 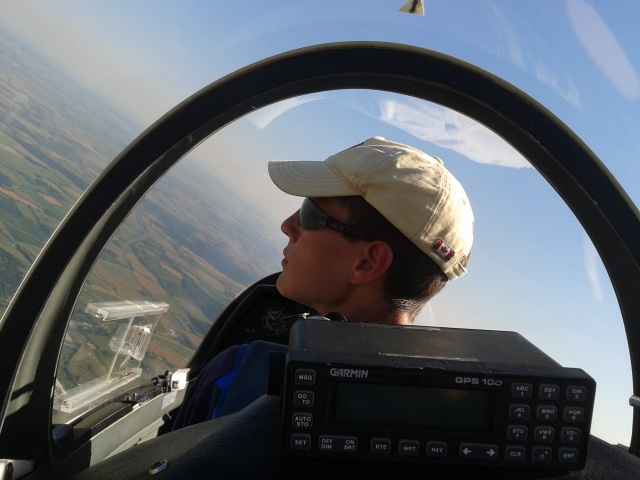 Don't forget to check all the relevant briefing material and get yourself (and your glider) out to Thame. 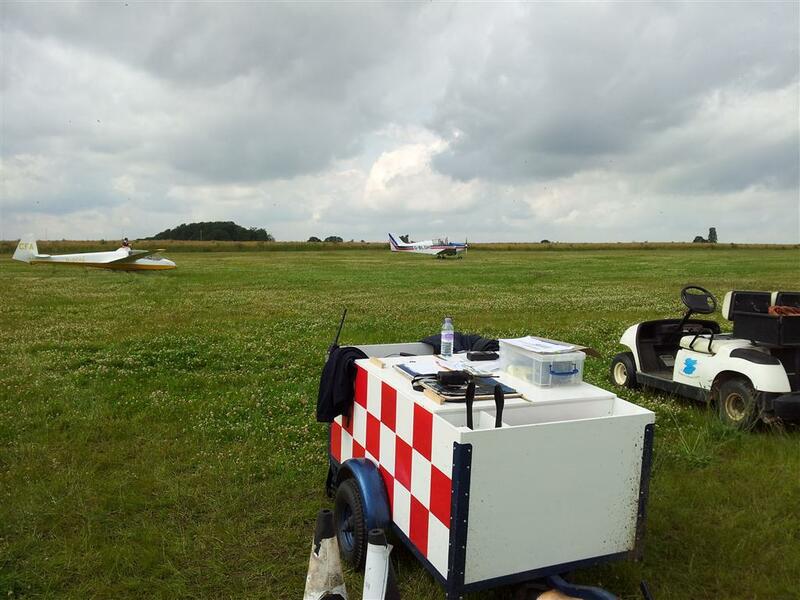 The Booker Gliding Club Events Team has had a busy four days at the Aviation Show section of the Goodwood Festival of Speed. 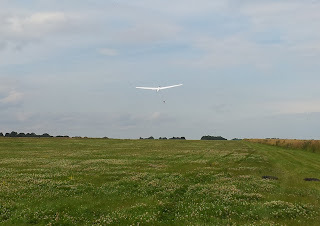 Many visitors were attracted by our new banners - and of course 20 metres of shiny Duo Discus - including members of other gliding clubs. We made sales and contacts and we are confident of further business as a result of the show. Other clubs should benefit too, as we recommended visitors from afar to clubs in Australia, Spain and Ireland as well as other parts of the UK. Many thanks to the team, all those who braved the traffic to get to their shift on time, Denis and Richard for helping with the set up, Bob for taking the Duo and a car full of banners home, and of course Chris for organising the event and producing all the materials. The team on Sunday 1st July, L to R Jane Moore with Graham's Brother, Graham Saw, Symeon Economou, Chris Collett, Mark Wolff. Despite the weather, Booker managed to go XC yesterday. After a full, blustery, showery, standard summer day the sky cleared and the club gridded. 968 (MiniGat), 768 (SuperWill), HA (Ryan O'Collett). J1M, KV (Baker Steve) and 969 (Geoff Lyons) lined up on the grid. Will set MEM o/r into the 20kt SW'ly and Mike C, Will, and I set off into a promising sky. Mike Gatfield would have joined us but fell down.Will chose the sun near Benson whilst Mike C and I chose the black line going towards NEW. Looking at the traces the black line worked OK but we had no decent thermals to climb in. With the strong wind that meant going backwards whenever we tried to climb! Will on the other hand had some decent climbs but with his usually boldness sped towards the turn and the ground for a couple of long grovels near MEM. Bored and frustrated with the lack of climbs I also went into the turn but ended up scratching off the ridge SW of MEM (there is one if you get low enough). Mike, on the other hand, invoked his girly side and stayed really high around the turn and then bimbled home. If you doubt my story, a quick look at the trace will show that he climbed onto a 27:1 glide in a 50:1 glider with a 21kt tail wind! After my climb I had a fabulous run home starting 400ft below glide with a good line and ending up 1500ft over by the ridge. All home, dead slow, honours went to Will (who else? ), beers in the Grouse.